I live in an Atlanta neighborhood called Reynoldstown. It's a bit transitional, literally on the wrong side of the tracks, and has a mix of races, ages, and collars. Some homes are rentals, and some are owner occupied. There are apartments and single-family homes. I closed on my home in late February 2007, when everything is still dormant from winter but the daffodils are just about to come up. 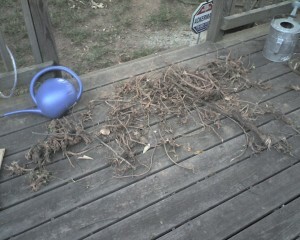 Hmmm, what are all these viney things I keep tripping over in the backyard as I explore my new property? Turns out it was kudzu, that notoriously invasive blight upon the southeastern landscape. I also had japanese honeysuckle, which has lovely-smelling flowers but is also invasive and destructive. These plants stifle biodiversity by choking out the other species, and left unchecked they will cover any and all surfaces exposed to light (and even some that aren't). After some research (especially this fabulously helpful website by a group in Spartanburg, SC), I learned that the only way to truly eradicate kudzu was to cut out the crowns. These are knobby root structures that store the nutrients for the kudzu during the winter so it can come out swinging in the spring and wreak havoc and ruin everything. After having acquired the necessary equipment, I took several hours on a Sunday and cut out all the vines I could find, just to get a little more control. Those suckers can grow more than a foot per day under ideal conditions. Casualties of war (kudzu crowns on my deck)Then, I went out almost every day for the next six weeks or so and spent an hour cutting out as many crowns as I could find. It was like a big game of Whac-a-Mole, because even when I thought I had found all the new growth there would be more. And once I'd gotten all of it, there was more the next day. Sometime in June, I started winning the war against kudzu, and it probably won't ever return (unless it comes under the fence from my neighbor's yard, because hers is a mess). Which is part of the point I want to make here: there are very low standards for garden maintenance for my neighborhood. Some people have cute little landscaped lawns with flower beds, and some people have a packed-dirt front yard with a chain-link fence around it. Some people have a new Beemer parked on a nice neat concrete slab, others have a rusted-out 1980s sedan with kudzu growing into it (I told you, my neighborhood is transitsch). So even though I made improvements to my backyard, it was just for my own benefit - there is no peer-pressure in in my part of town. New bambooNow, nearly three years later, my yard has some nice bamboo along the back fence (the non-invasive kind), some clematis, and a couple magnolias that are growing nicely since the kudzu was killed. However, it still needs a lot of work. This is not a story about how my yard went from being overrun with kudzu to perfectly manicured. It's a story about how I set out to achieve a goal and, whenever I felt like it, did a little something to get closer to achieving it. It's a story about not setting my standards too high, too fast. It's a story about how any progress toward a goal is can be helpful. Yes, my friends, be underachievers - but be achievers! For example, I wanted to start blogging more regularly. I'd been trying to do this for four years. Finally, instead of trying to do it every day or on some fixed schedule, I decided this fall to do it whenever I wanted to. I reasoned that, just like my backyard, anything I did would be an improvement. Penelope Trunk helped, too, by giving me permission to start before I got organized. And now I have built up some momentum, so I'm posting more regularly. I have managed to completely avoid negative feelings about not doing it, which keeps the entire experience a happy one. When I was cutting out kudzu crowns, I made a game out of finding them. "Aha! You may have cunning means of survival, but you are no match for my handsaw!" If I had known at the beginning how much time I would spend successfully ridding my yard of kudzu, I'm not sure I would have had the happy attitude. But doing a little bit every day was tolerable and fun, and not doing it would have meant stasis, not failure. The Neglected Backyard Approach works in a lot of areas. It helps you to forgive yourself for not knowing the things you didn't know you needed to know, by resolving to do better next time. It helps you get out the stupid free weights and start moving your arms up and down. It helps you to learn an instrument by acknowledging that any time you spend playing the thing is going to help you learn it over the long run. It helps you to not do things, too: turn off the TV, put down the cigarette, and so on. Think in terms of tiny incremental improvements. Kaizen. Progress, not perfection. The Neglected Backyard Approach might even help me deal with the neglected backyard itself: it's mid-January and I still haven't raked up the autumn leaves. I can't rake the entire thing, but I might do twenty minutes worth. It's a nice day. "So what did you use computers for?"